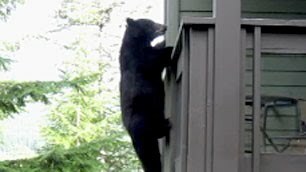 A black bear in British Columbia decided to scale a 3-storey building to get to tomatoes growing on a balconey in a window box. Using his claws and teeth to get a grip on the window siding, up he went until he reached his intended target. A resident of the condo grabbed his vidoe camera to record the amazing feat. Click on the link in the titile above to see the video.